Sarah Jane Szikora News – ‘The Merry Widow’ & her gingerbread man new boyfriend! ‘The Merry Widow,’ is a lovely happy image, reminiscent of the big hollywood musical movies of years gone by, I think we are in the finale of a great number, im sure of it! I love the fact that nearly the whole ‘set’ is made of sweets! from jelly babies as the supporting cast, to lolly pops in the middle and even the plinth the gingerbread man & the ‘fat’ lady are standing on appears to be marshmallow, yum! We wrote previously that there are meanings to each of Sarah’s picture and in this one, we have been reliably informed that this represents the end of Szikora’s ‘marriage’ as she is now out of contract with her previous publisher and is now a ‘Merry Widow’ which I think is a brilliant pun. And we have her new gingerbread man ‘boyfriend’ who is happy to dance with her and accompany her in the ‘closing number’ of this big hollywood musical! We finally have some words from Steven Townsend & his family about the background of his new limited edition print: ‘Tommy’ and a little bit about the dog and why he was chosen to be painted. “Tommy was named after our 2nd grandson who was the first baby in the UK to be born on Remembrance Day 2008. He is called Tommy in honour of the First World War Veterans. Steven finished the painting on the same day and so it seemed fitting to call it Tommy. 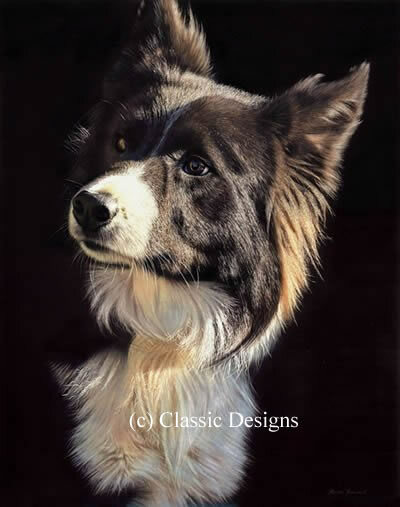 Victor was of course the same dog from the very successful limited edition print of the same name, released May 2008 and featured a head and shoulder study. 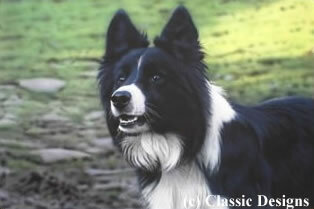 Steven also tells us that the dog has a lovely temperament and he hopes this comes through in the painting. As always we have to point out that the 2 pictures here are in fact paintings and not photographs, Steven’s amazing talent allows him to produce near photorealistic paintings! We are pleased to announce the first in what may possibly be a range of tribute/posthumous limited edition pieces by Govinder Nazran, released by Washington Green publishers. 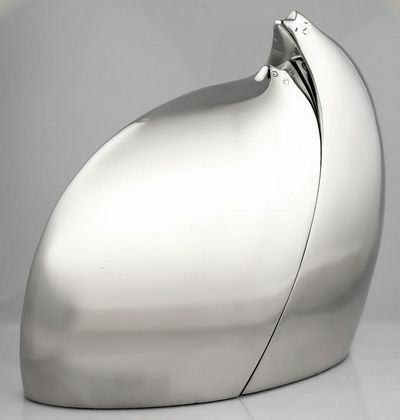 These 2 cats, together form ‘Lean On me’ the first ever stainless steel sculpture by Govinder. ‘Immortal, immaculate and invincible’ are the words that come to mind when you see this piece in person, a fitting tribute to the man and his artwork. 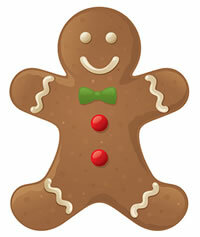 Sarah Jane Szikora: L’enfant Terrible – Gingerbread man in trouble! 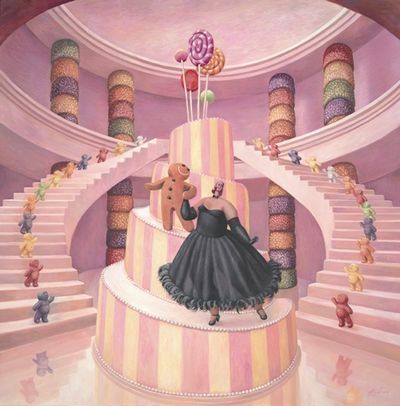 Our plan is to comment on each of Sarah Jane Szikoraâ€™s 8 new images in turn, So today we will get the ball rolling and hopefully time will allow us to finish all 8 pieces! 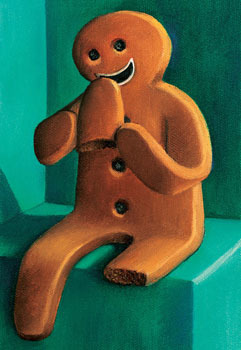 This image, obviously features her most popular character, namely the gingerbread man! and a particularly cute one at that. He looks to be a little sad in this pic but donâ€™t worry, I’m sure he is just about to be released any minute by a friendly jaffa cake! There are several ways this picture can be interpreted, other than the cuteness of the image. The fact that this Gingerbread has in the eyes of some been a â€˜terrible childâ€™ is the literal translation of ‘l’enfant Terrible’..that is the simple explanation of whatâ€™s happening in the picture i.e. he is being punished for something. One perhaps unobvious representation, is that Sarah is now legally able to self publish her images as of February 2009, something she has been unable to do in 2 years, this restriction being her â€˜ball and chain.â€™ Iâ€™m sure, as an accomplished artist, the burden of not being able to get her artwork ‘out there’ was very frustrating for her. But L’enfant Terrible is also means a child who is ‘terrifyingly’ candid by saying embarrassing things to adults, namely their parents â€“ Sarah has produced a picture that perhaps draws on her frustration and through her painting she is being outspoken! L’enfant Terrible can also mean an unusually successful person who is strikingly unorthodox, innovative, or avant-garde â€“ certainly her images are unlike any other naÃ¯ve art that come before her, so this definitely applies. -an older limited edition & one of my favourites! 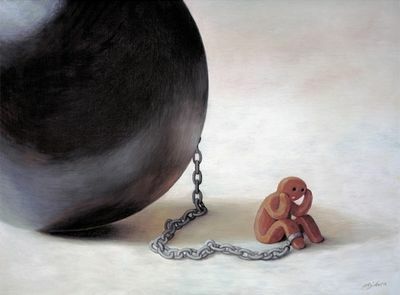 However you choose to look at this picture, donâ€™t forget to enjoy the simple pleasure of visually enjoying the artwork.